Use topically for wounds, sores, viral lesions, and nail fungus. Usnea lapponica is an excellent choice for dermal healing. It has proven to be active against a number of viruses that present sores and lesions including herpes simplex, polyomavirus (a tumor virus), Junin virus, Tacaribe virus, and Epstein-Barr. It may be used as a wash for the treatment of Impetigo (staph or strep infections of the skin) and jock itch (antifungal). 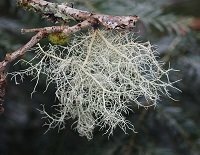 Usnea is a lichen that is slow growing and is sensitive to air pollution, especially sulfur dioxide, a by-product from combustion of petroleum and coal. The Usnea harvested for this tincture is from a pristine area, an altitude of 5,000 feet, isolated from sulfur dioxide pollution.